After seven months since her last press conference in December, Hillary Clinton appeared before journalists last Friday. As Slate.com reported, “Clinton spoke at a joint convention being held by the National Association of Black Journalists (NABJ) and the National Association of Hispanic Journalists (NAHJ).” This lengthy hiatus has brought heavy criticism from Donald Trump’s campaign, and even from the mainstream media. Clinton held what many called a press conference in Washington, DC, last Friday that was open only to members of the NABJ and NAHJ – two ethnic groups that are generally friendly to her – according to a press release for the event. “It is notable that Democratic presidential nominee Hillary Clinton has recognized the 2016 NABJ-NAHJ Convention as a vital gathering to discuss her platform and the issues impacting black and Latino communities,” said NABJ President Sarah Glover in the news release. While the Slate piece was generally not complimentary of the responses Clinton gave to questions from the journalists, it did not mention the positive reaction she received to campaign positions prior to the question/answer period. Slate suggested the questions were submitted in advance for approval. A campaign appearance at a minority journalist organizations’ convention, with attendance limited only to members of those organizations, does not a press conference make. It isn’t difficult to understand why Clinton, or any candidate, would want to speak at such an event, but it is fair to ask why objective journalists of any description would allow that, let alone invite it. No matter what you believe about the Iran hostage release and potential ransom payment, no matter what actually transpired, the utter clumsiness of making a payment for any purpose that way on that date warrants more than a half-minute in a three-hour program that spent 84 minutes on the Trump issues. All major media organizations spent hours of broadcast time and dozens of printed pages on the Republican and Democrat nominating conventions. At each of these events one speaker addressed the delegates about the loss of a child. The following week at the Democrat convention Khizr Kahn and his wife Ghazala appeared and Mr. Kahn talked about the death of his son, Marine Capt. Humayun Khan, who died in Iraq heroically protecting his men. Kahn described himself and his wife as “patriotic American Muslims, with undivided loyalty to our country.” He then criticized Donald Trump for his comments about Muslims, and said, “You have sacrificed nothing and no one.” Predictably, Kahn’s comments about Trump triggered a response. The First Amendment protects free speech, and that includes newspapers, television and radio news operations; they are free to say what they like, bound generally by the same restrictions as individuals. The difference is that the public depends upon media sources for information upon which people base important decisions, such as deciding whom to elect to important positions. 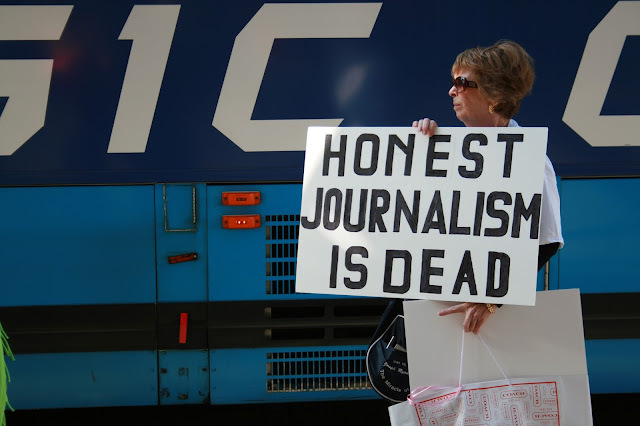 Therefore, news organizations have a solemn duty to provide balance to the news they cover and how they cover it, and news journalists – as distinguished from opinion journalists – should be proscribed from injecting bias and opinion into their work. These recent examples show decision-making by journalistic organizations in selecting a convention speaker that raises questions about objectivity, and a clear, undeniable lack of balance in reporting on important events that Americans will use in deciding their choice for the presidency and other offices. Surely the U.S. media can do better than this. It is the same over here. Trump say the slightest thing and headlines are made and the only time we hear about Clinton is when she is bagging Trump. I read something about your media preferring Hillary to Trump. There is no honor among news journalists in the U.S. these days, and apparently other places, as well. Somewhere along the way, the people who report the news missed the idea that reporters and news organizations have the job and duty to tell the public the what, who, when, where and why objectively and accurately, not to take sides. The news industry in the U.S. is largely corrupt and many/most of those who work in it are unworthy of the trust they have been entrusted with. It's a sad commentary not only on journalism as a profession, but on the ideals upon which the U.S. was founded.